How often do you get the chance to get your hands on an original vintage 1962 Fender Jaguar in the super rare custom colour, Sonic Blue? Well here on V&R we have only had 1-2 for sale over the years, so we were looking very much forward to demo this old & beautiful jewel. The Fender Jaguar introduced in 1962 as a top-of-the-line model – designed to attract players from Gibson. The production ran over only 13 (1962-1973) years since guitarplayers found more interest in fx. Stratocasters and Telecasters. It achieved it´s popularity on the surf guitar scene. The one we have here is from September 1962. All original with case. 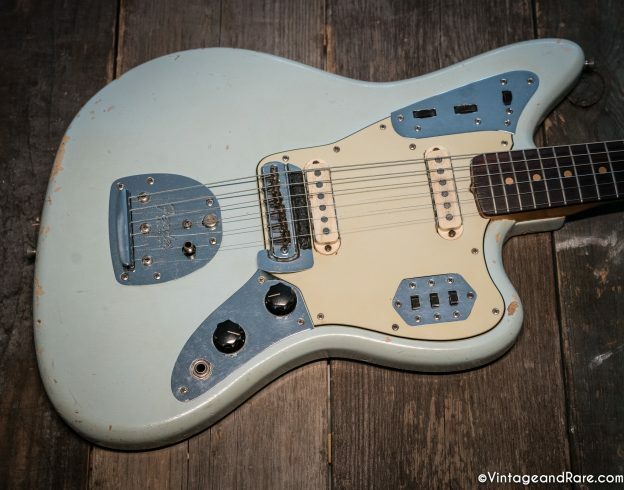 Sonic Blue is a very rare custom colour for the early production Pre-CBS Jaguars, so we did not hesitate much when we were given the opportunity to demo this jewel. 1964 Selmer Zodiac Twin Fifty / 1992 Marshall 6101LE 30th Anniversary / 1966/67 Vox Grey Wah / DryBell Vibe Machine V-2 / Simble Overdrive / Bixonic Expandora EXP-2000R / Industrialectric RM-1N / Strymon BigSky / Strymon DIG dual delay. The Dream Sequence from Hologram Electronics landed on our desk a few months ago and the other day we took it out for proper test drive on our pedal board. This pattern-based multi-effect pedal certainly is in a league of its own and is an endless source of inspiration for the creation of a wide variety of cool soundscapes. Like the name says, this little powerhouse combines a pattern sequencer with a bunch of effects geared towards spacey, pulsating sonic architectures with a rich, dreamlike quality and a distinctive synth-like feel. We have always been huge fans of the Fender Custom Telecasters. We recently got our hands on an original L-series Pre-CBS 1965 Fender Custom Telecaster. On the clip below you can see and hear Klaus from V&R take a spin on it. The Fender Custom telecaster is different from the Telecaster Custom in the way the it has other features. 2 different models. In 1959 Fender came out with a new model – the Fender Custom Telecaster. If featured a double bound body. This year Fender also started to do slab-board fingerboards. Apart from the body binding there is no difference from a standard Telecaster. It´s all about the binding. Introduction to V&R Electronic Sessions. Vintage & Rare loves guitars and we love guitar pedals too, in fact we love everything about the tools of the past and present musician and we love all the creative souls who either used or are now using a superbly crafted custom made guitar or the ingenious design of an electronic circuit. On Yeahman´s Guitar Fest in Burgdorf / Switzerland Sep 17th 2017 we came a fantastic vintage 1962 Fender Stratocaster in the highly collectible and sought after custom colour, Fiesta Red. Our friend and swiss guitarplayer, Baptiste Bouli Amstutz, kindly took his time to take it for a spin on camera for us. In the video you can also hear Michael Marti from Yeahman´s Guitars talk a bit about it. Big thanks to The Silver Company for letting us use their fantastic trailer for this demo. Hope you enjoy the video. Please let us know what you think in the comment section below. On Yeahman´s Guitar Fest in Burgdorf / Switzerland Sep 17th 2017 we came across a near mint condition 1957 Gibson ES-175D. Swiss guitarplayer, Baptiste Bouli Amstutz, kindly took his time to take it for a spin on camera for us. In the video you can also hear Michael Marti from Yeahman´s Guitars talk a bit about it. Big thanks to The Silver Company for letting us use their fantastic trailer for this demo. 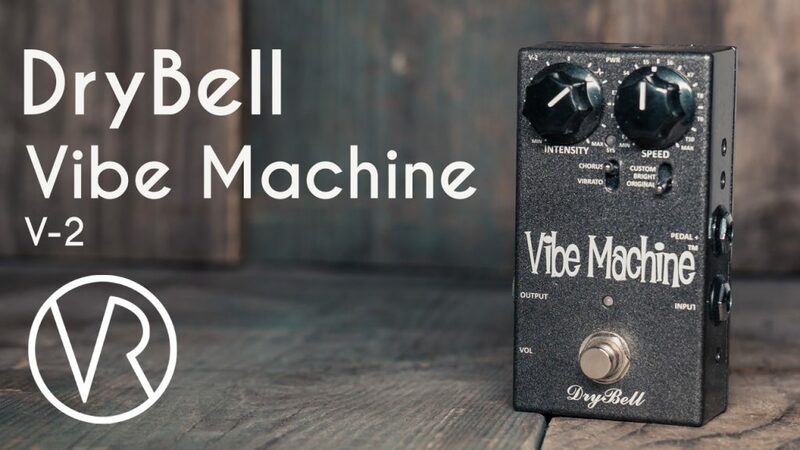 Check out our demo of the Vibe Machine V-2 from croatian boutique vibe builders – DryBell. 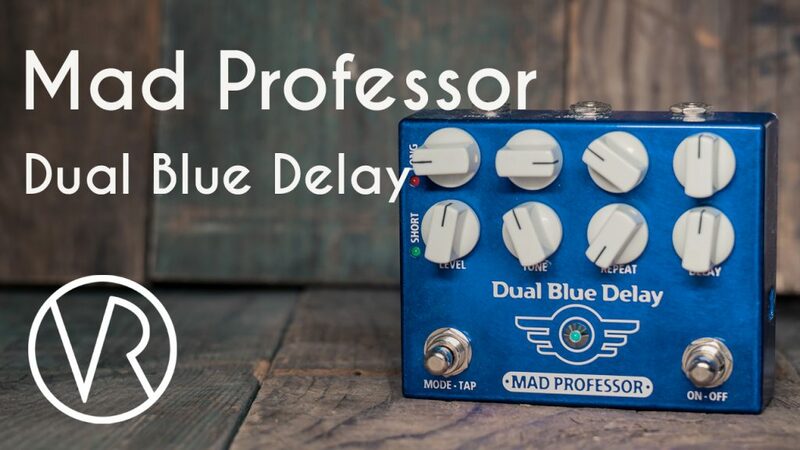 If you are looking for a fantastic sounding & small size vibe pedal with lots of great features – then this one would be something for you to try out. We highly recommend the Vibe Machine V2. Hope you like the demo. Please let us know what you think in the comment section below. A little while ago we noticed the new Freqout – Natural Feedback Generator from Digitech by Harman. It recently landed on our desk and so we decided to talk it for a spin. And we must say – it has been a long time since we have had so much fun with a new pedal. This is game changer! Check out our demo below and please do not hesitate to let us know what you think in the comment section below.